When I began my research on arts incubators as the financial crisis was waning in 2012, it appeared as though arts incubators were on the verge of becoming a national phenomenon that could meet both artistic and economic development goals simultaneously. Policymakers expressed strong interest in the phenomenon. However, the post-recession surge in incubator activity appears to have plateaued as new programs face the same challenges of revenue generation faced by their clients and, perhaps, because arts incubator impacts, especially indirect community development impacts, are as yet unproven. My research opens the black box of incubator operations to find that they create value for client artists and arts organizations both through direct service provision and indirect echo effects but that the provision of value to communities or systems is attenuated and largely undocumented. The primary recommendation that arises from the cross-case analysis is for arts incubators to adopt an ongoing program of formative and summative assessment that can be used to foster organizational learning and lead to evidence-based decision-making. Adapting the families of variables advocated by Mian (2011) for the evaluation of university technology incubators, I suggest that arts incubators evaluate their processes, their output performance, and the impact of the value created in the context of their strategic priorities and organizational goals. 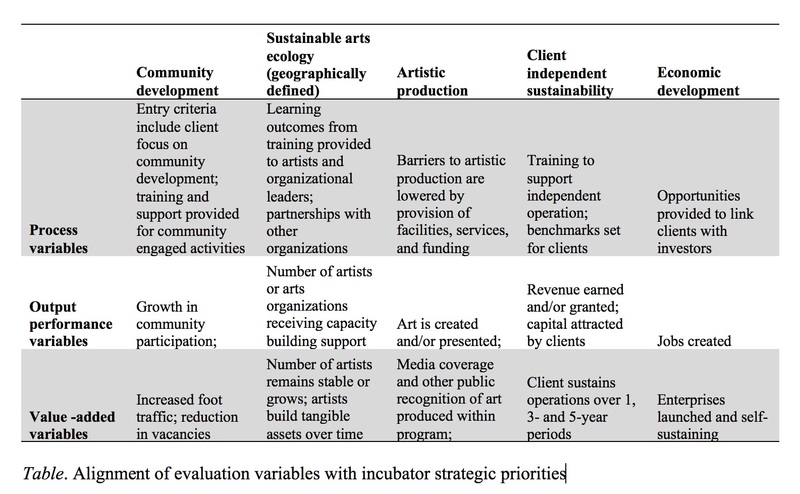 The table below suggests some variables that could be evaluated at the process level, output level, and value-added level across the strategic priorities articulated by the incubator stakeholders I have interviewed over the last year. What is an Arts Incubator? This entry was posted in Arts entrepreneurship, arts infrastructure, Arts policy and tagged arts incubators, community development, economic development, Evaluation, Evaluation and assessment, evaluation variables. Bookmark the permalink. Sorry for sending this message two times in different posts.. thank you again..